Prep. Time: 15 min. | Cooking Time: n/a min. When food is organic or raw, you know it will be good for you! Although raw milk and cheese are banned in some parts of the world, many tout the health benefits. Be sure to follow strict guides for cleanliness. Keep the refrigerator at 4 degrees C or 38 degrees F or cooler. Pay attention to any signs of spoilage or odors. There are no preservatives! And, be prepared to delight your taste buds! Blend all ingredients in a high-speed blender until smooth. Place the mixture in a strainer that has been lined with cheesecloth and place a weight on top. The weight should not be so heavy that it pushes the cheese through the cloth, but heavy enough to gently start to press the liquid out. Leave to culture for 48 hours at room temperature. Once culturing is complete stir in the following ingredients: ¾ teaspoon salt and 2 teaspoons nutritional yeast. Transfer the cheese to a ring mould, remove the ring mould and then transfer to a dehydrator for 12 hours at 105ºF. The dehydrator is an optional step to give the cheese a rind quicker. You can also just put the cheese in the refrigerator straight away, without the dehydration step. Remove from the dehydrator (if you did this step) and place in the refrigerator. The cheese will continue to firm up and develop a rind in the refrigerator. Enjoy over a few days on raw flax seed crackers, raw onion bread or simply as a spread on slices of cucumber. 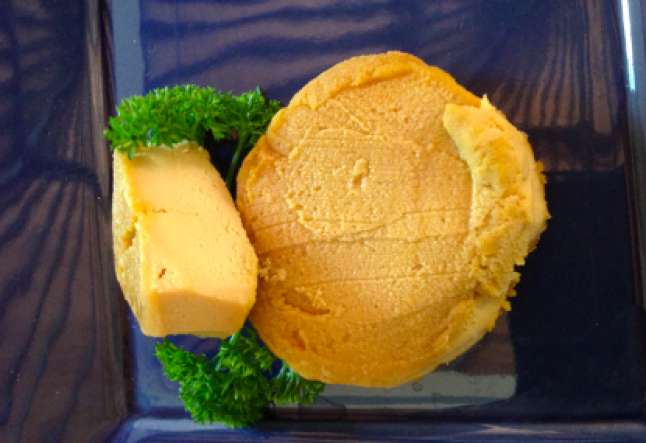 Notes & tips: Cashew cheese tends not to be as firm after the culturing step as macadamia cheese. If you find the cheese doesn’t hold it’s shape when you remove the ring mould, you can simply leave in the ring mould in the refrigerator for 24 to 48 hours. By that time the cheese will have got firmer and will hold its shape.